Swing traders know that biotech has been the sector leading the market. My favorite biotech stock right now is CEMP. 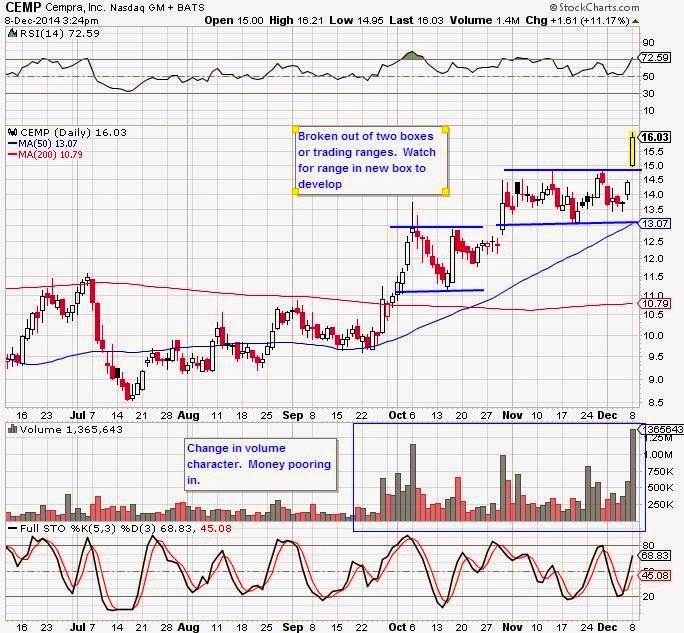 The keys to a great momentum stock are volume and price action. Volume has been pouring into the stock early October breakout. Each new breakout has been followed by strong volume and low volume pullbacks. These pullbacks show strong price action, with each breakout forming a trading range or box followed by a new breakout. The new breakout forms a new box. Let’s watch for a new range to develop and then buy the bottom of the range. If you would like to learn more about how I trade, receive my nightly focus list with market analysis,setups and trade alerts, sign up for a 7 day free trial at BullsonWallStreet.com. Is Tesla’s stock headed to the graveyard? Another awesome post. Thanks Paul. The insights i get from your posts and videos have made me a way better trader!